Taking a tip from the aviation industry and as a relatively novel concept within the coach industry we have rolled out our bespoke seat back safety cards this week. The first 1,000 have been distributed amongst the first part of the fleet. Driver Sam Hall is seen with some examples in GD14 LAK which was one of the first examples to carry them on a London Weekend tour with very good feedback. We hope that on your next journey with us you take a moment to familiarise yourself with your safety card to improve your comfort and safety. 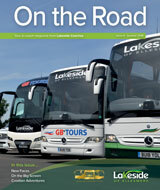 The 1st April saw Lakeside Coaches celebrate its 30th birthday. The 1st April 1979 was the date that Chairman John Davies bought the rather more modest Lakeside Coaches Minicoaches business from Charlie Bolland of Ellesmere. 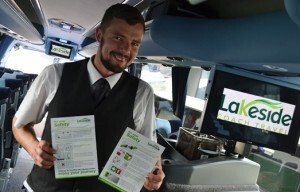 Through continuous growth, determination and strong leadership this small town minicoach operator has turned into a Nationally recognised coach operator which has been a finalist in the UK Medium Coach Operator of the Year Awards for the last 2 years running. So after digesting the superb bespoke cake (in green and white of course!) it is now a case of head’s down into the busy season of the year as yet more top class new recruits join the team to further meet the need of our expanding enterprise. The third of three winter/spring deliveries has arrived in Ellesmere. 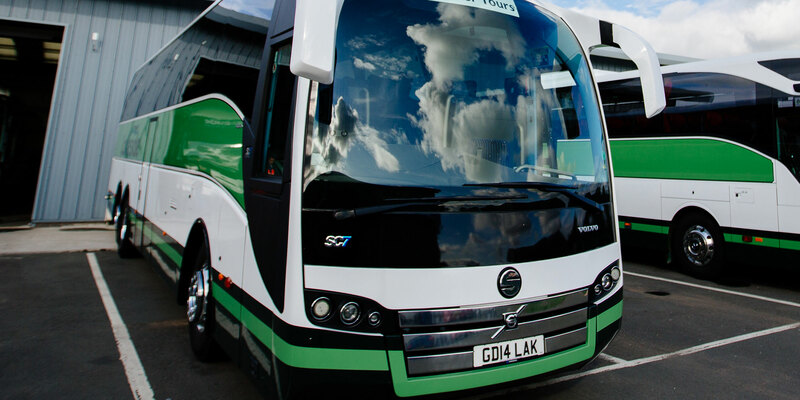 This being a Volvo Sunsundegui SC7 59 seater coach (including WC/washroom) to our usual full executive specification. This vehicle is the first triaxle coach in the fleet and as such is the longest at 14 metres in length. It was built to order and is freshly shipped from Spain, to be one of the first to hire this vehicle get in touch with our reservations team.